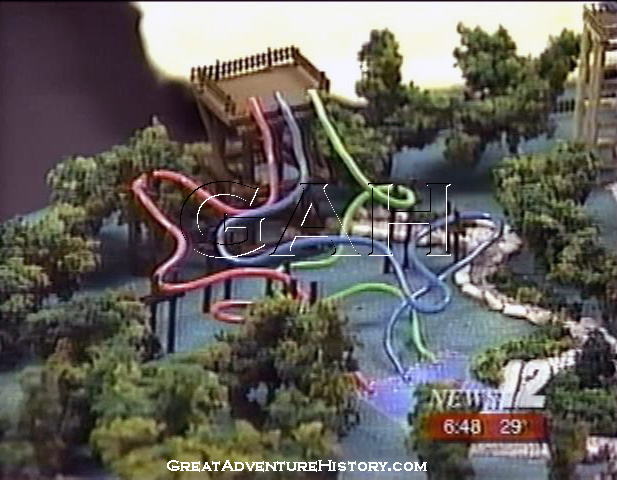 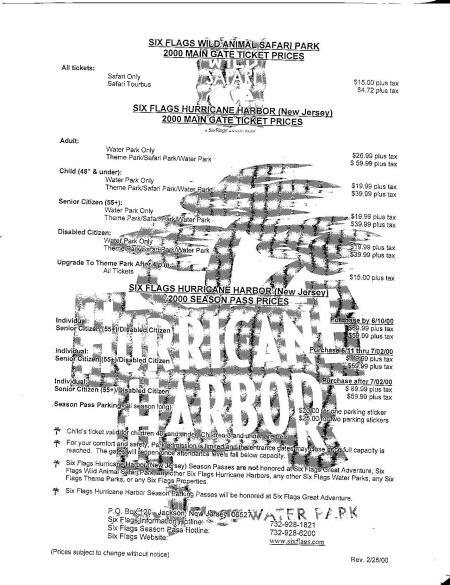 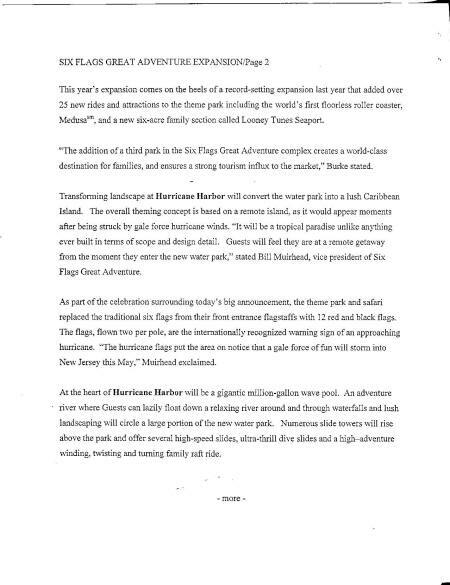 Throughout the 1990's, theme parks around the country were developing waterparks to help expand their offerings, and Six Flags was aggressively adding their signature Hurricane Harbor waterparks to the larger properties around the country. 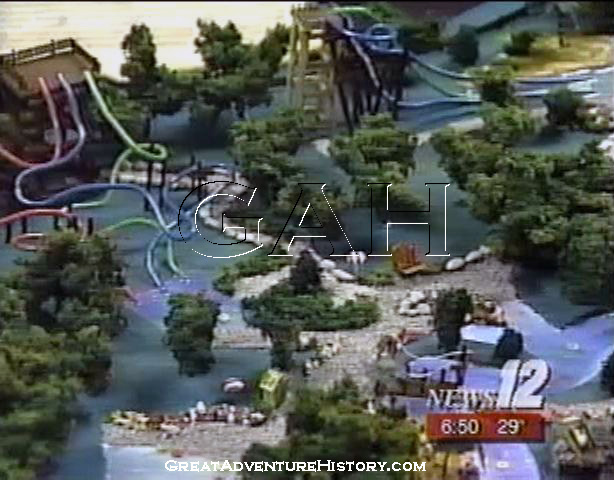 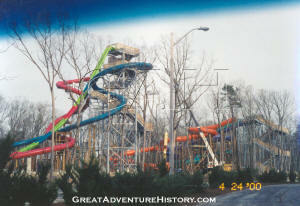 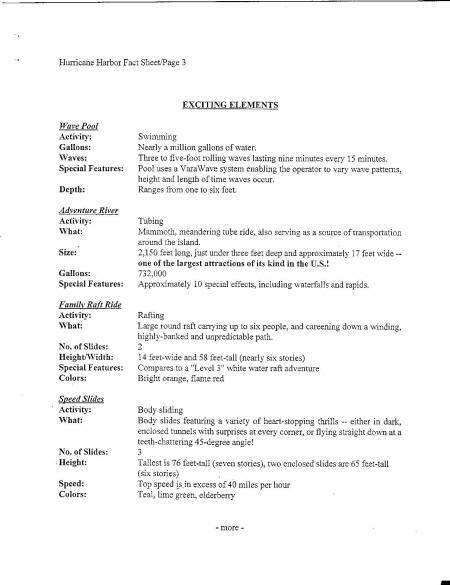 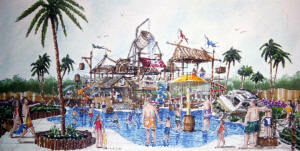 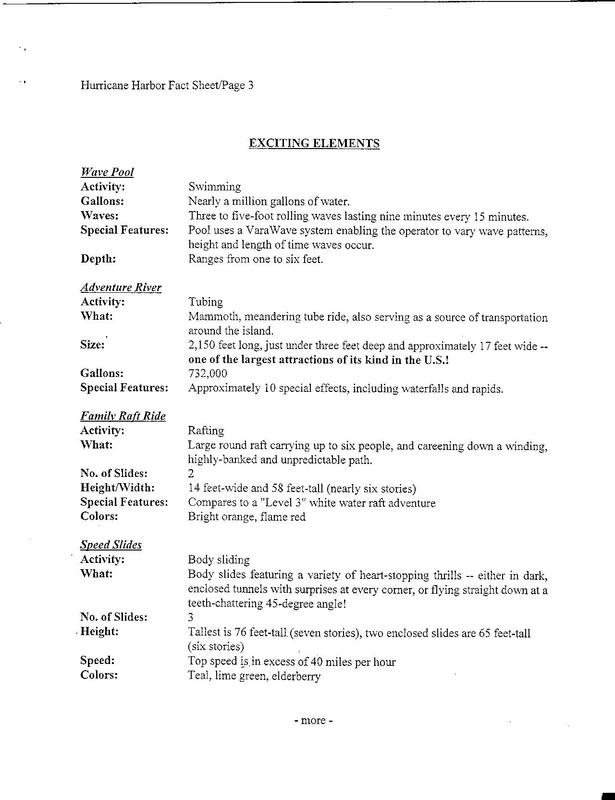 The waterparks offered a wider range of attractions and created a new reason for guests to visit for multiple days. These parks generally followed the proven formula of a handful of slides in varying heights and sizes, lazy river, wave pool and play structure, all set in a tropical feeling location complete with food and shopping. Being the largest of the Six Flags properties, Great Adventure's Hurricane Harbor was the largest and most elaborate design built during that era, and set a new standard for waterparks in the area. 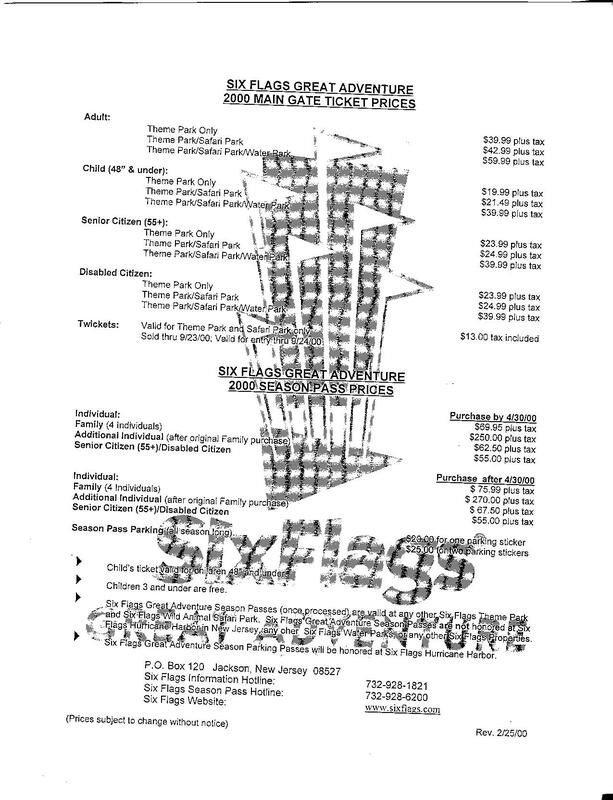 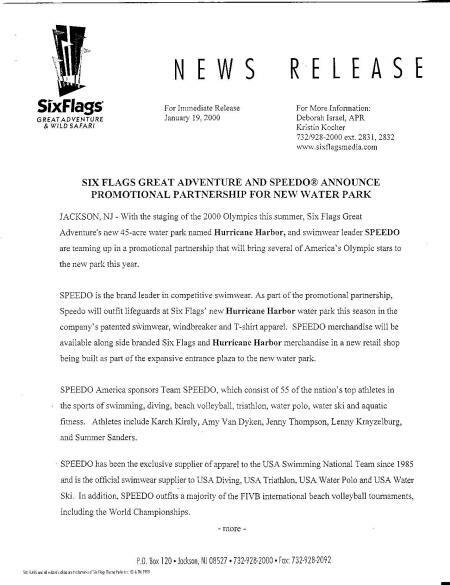 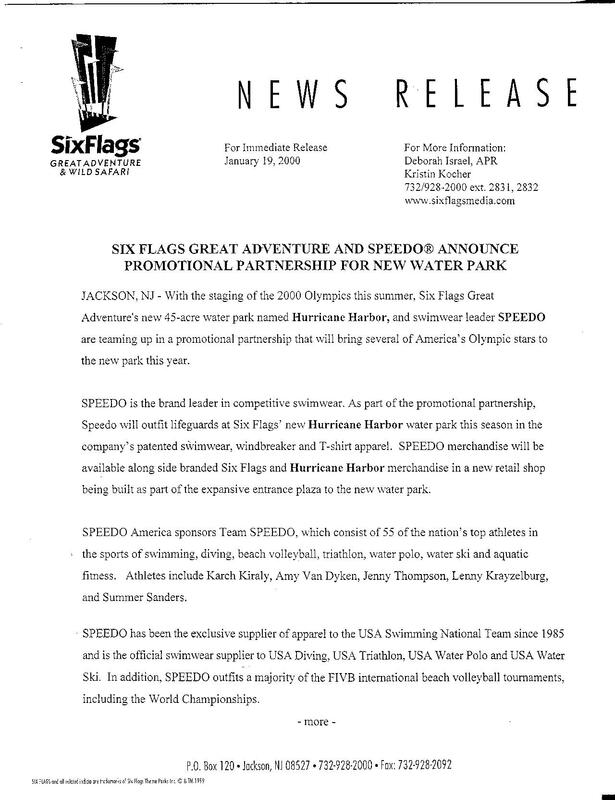 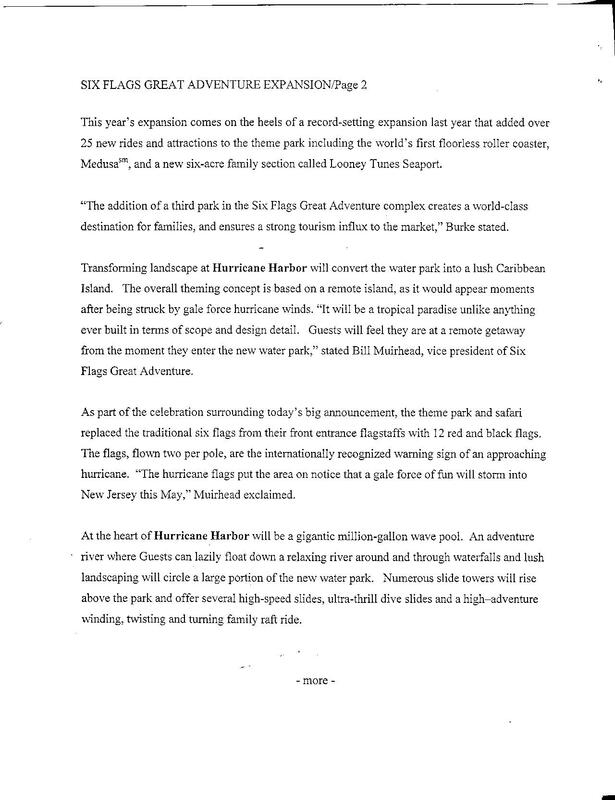 In 1999, Six Flags announced the construction of a huge new separate admission waterpark on the Six Flags Great Adventure property. 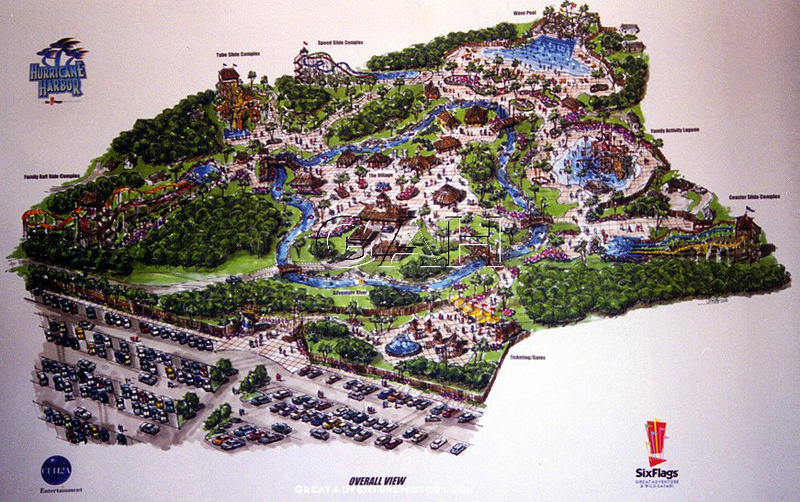 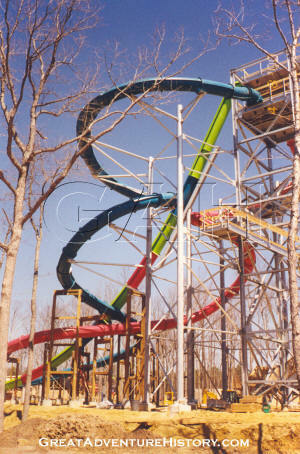 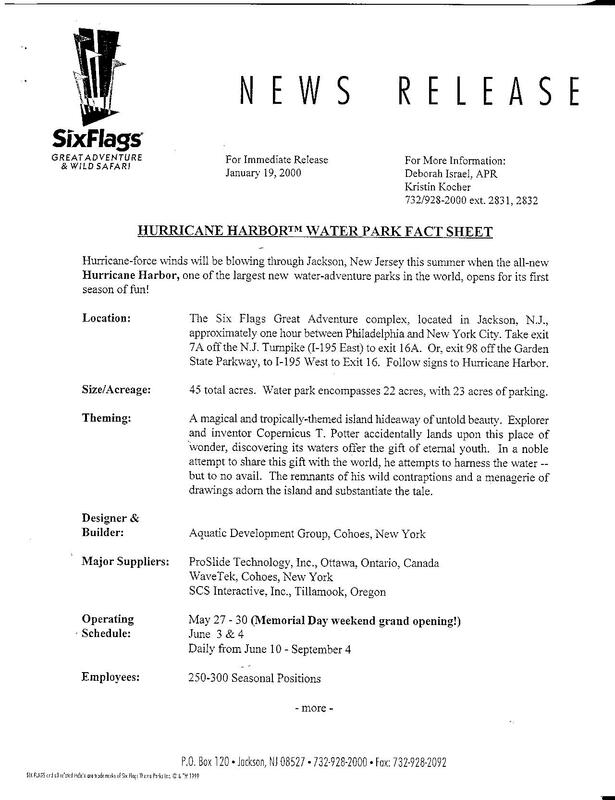 Six Flags Hurricane Harbor would be the largest expansion in the park's history, following the 1999 "War on Lines" in the theme park which had previously been the largest expansion in the park's history. 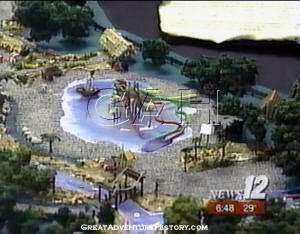 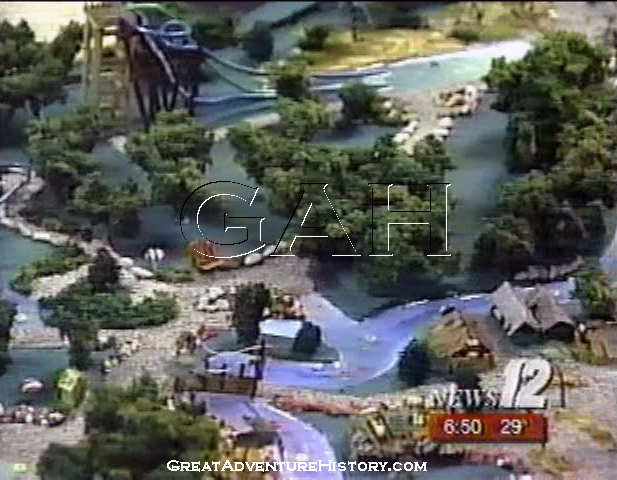 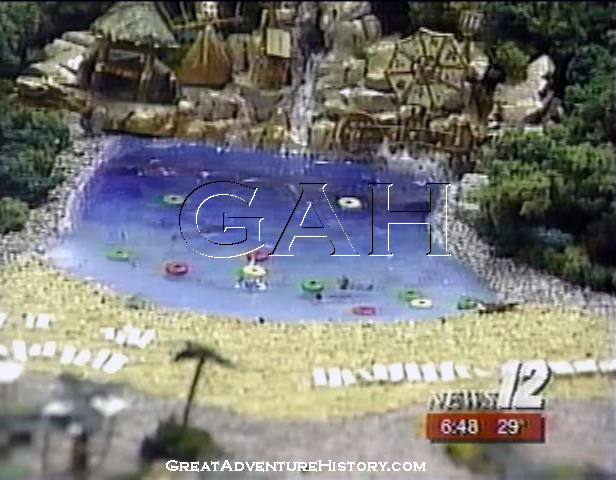 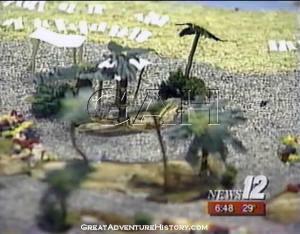 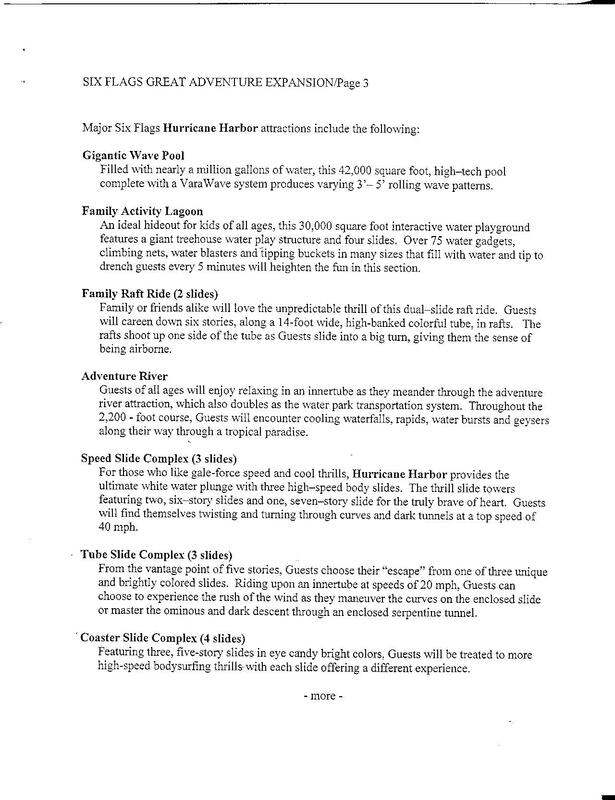 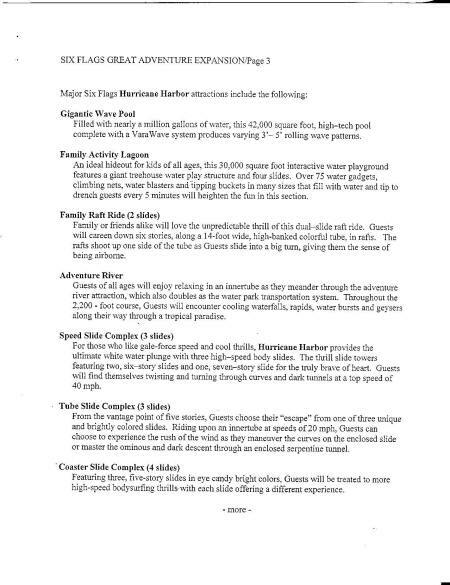 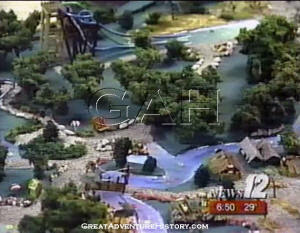 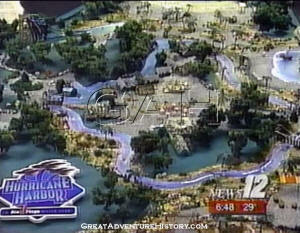 That "War on Lines" expansion had resulted in the removal of the theme park's water ride section, Adventure Rivers, which had been kind of a mini-waterpark within the park. 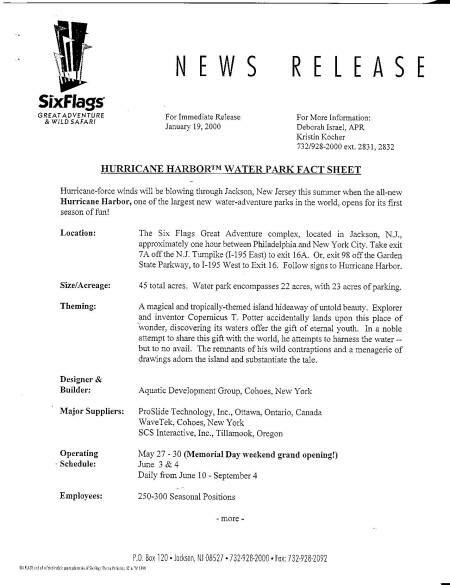 Six Flags Hurricane Harbor would be a full sized waterpark featuring extensive tropical theme elements and a wide variety of water attractions ranging from tall and fast body slides to gentle family friendly play areas. 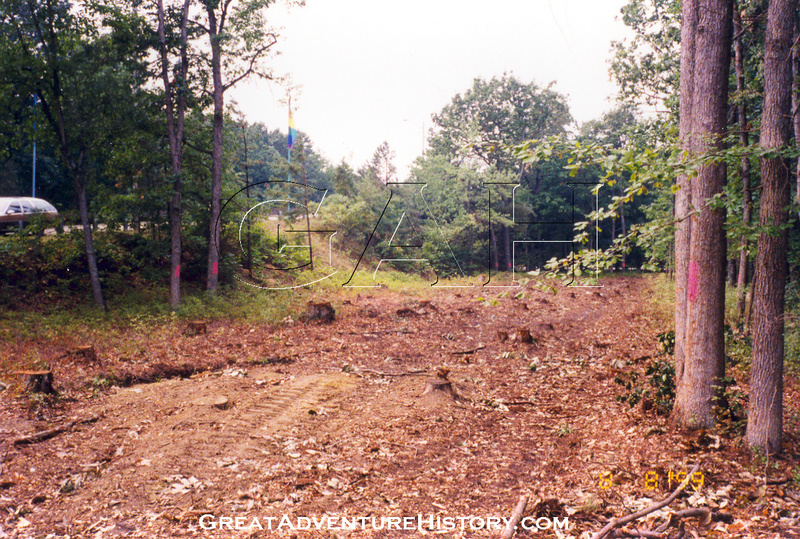 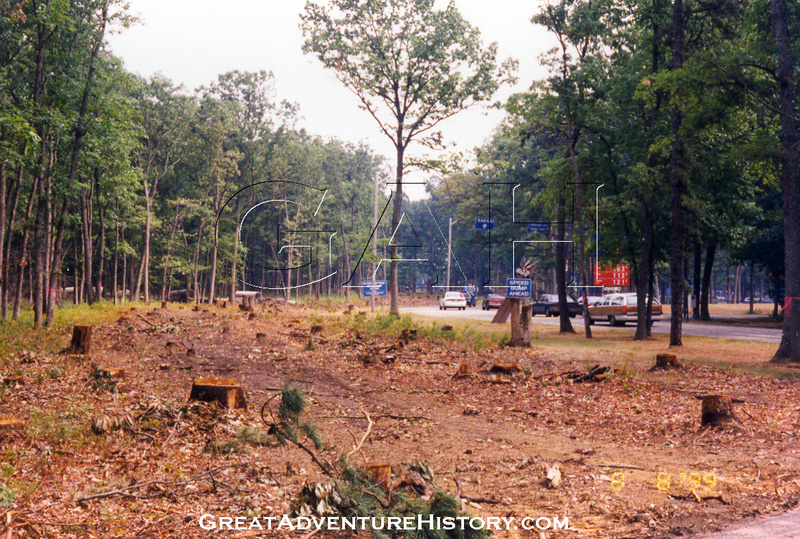 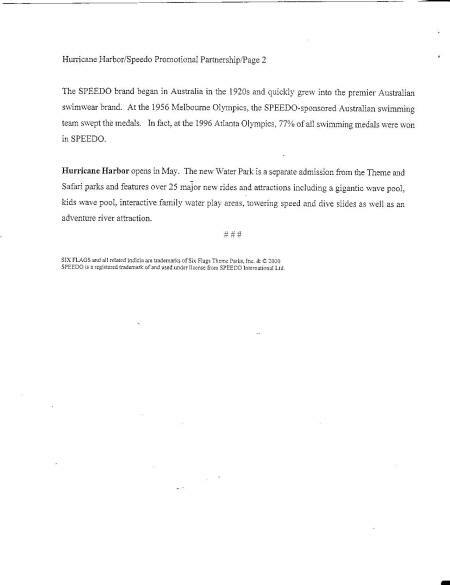 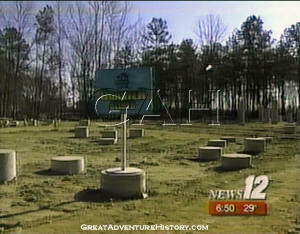 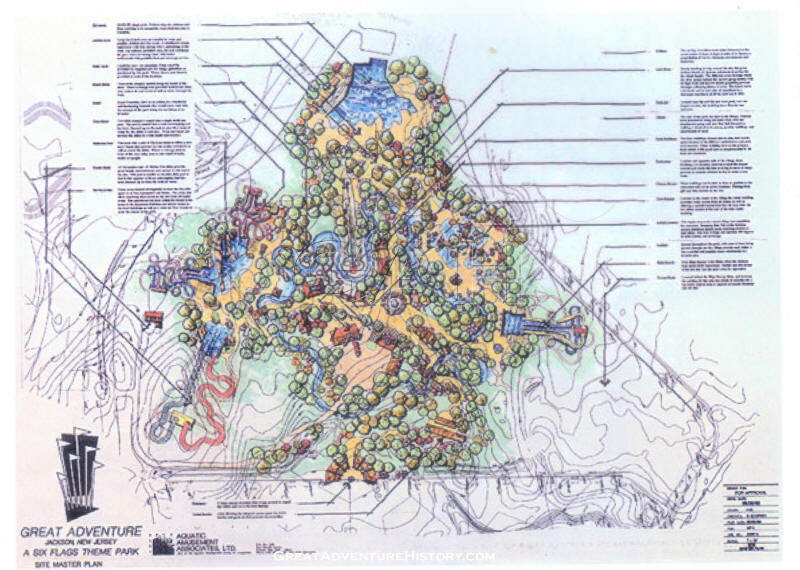 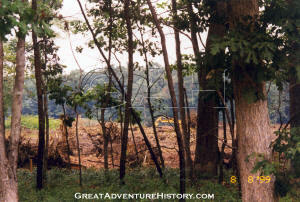 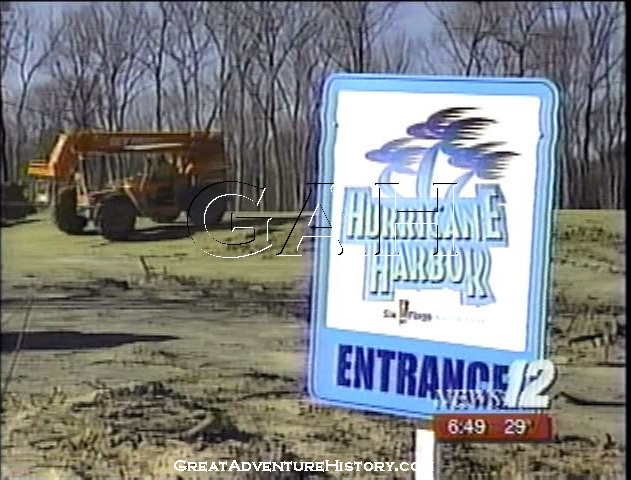 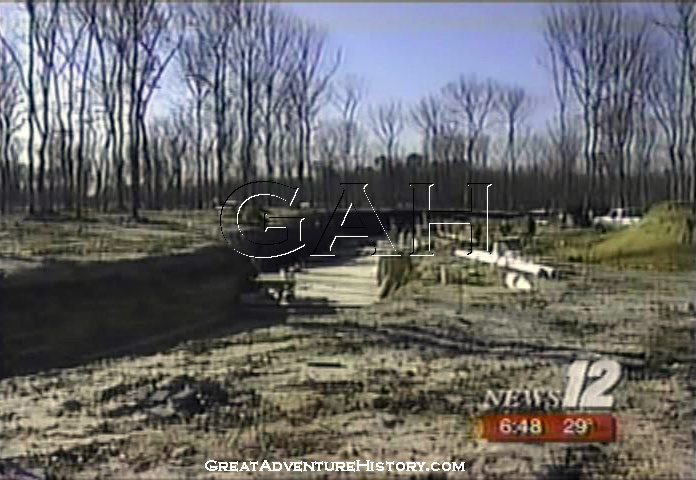 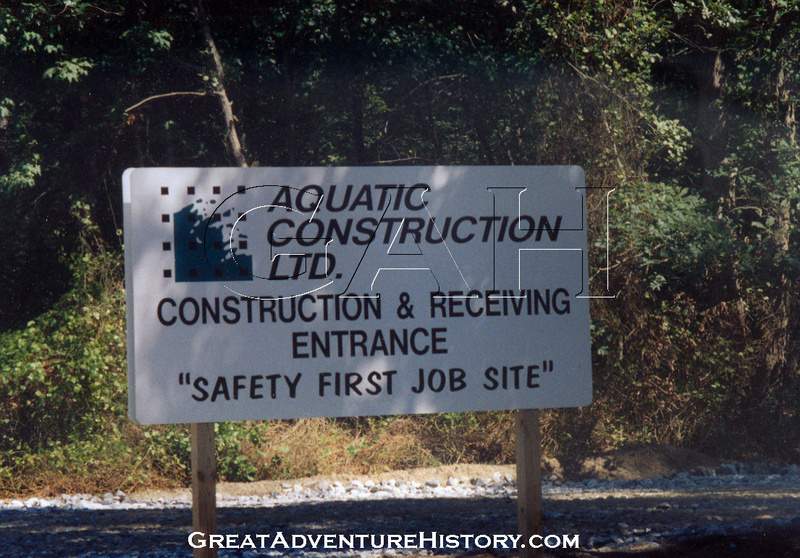 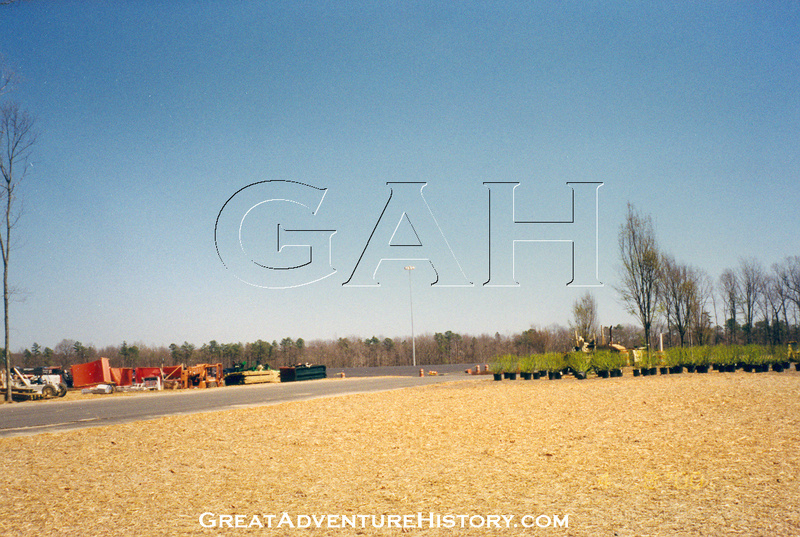 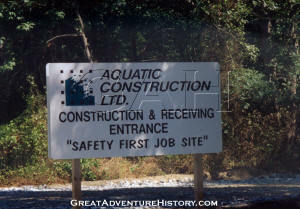 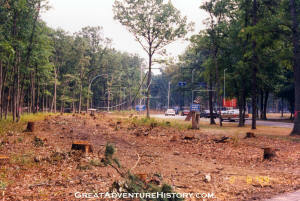 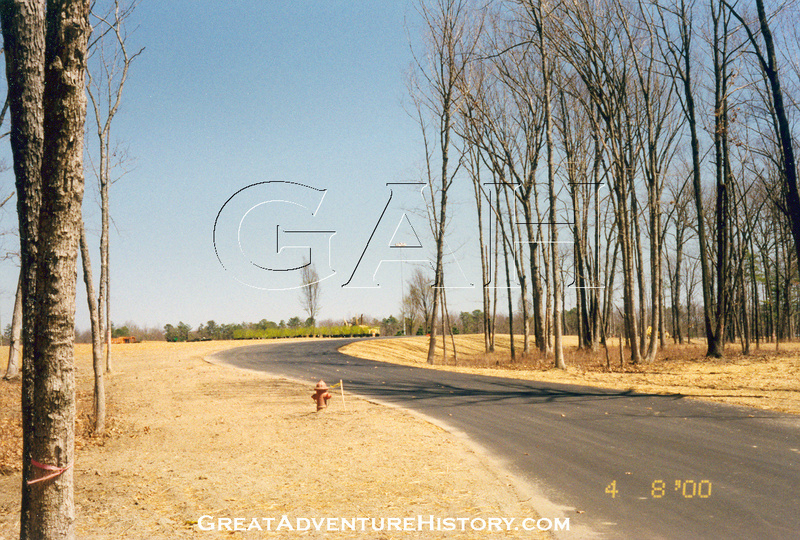 Site preparation for Hurricane Harbor began over the summer of 1999, with a large number of trees being removed to create new entrance and exit roads for the park along with a large new parking area. 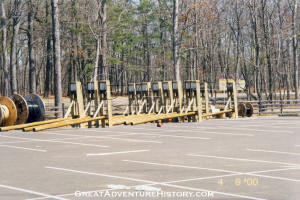 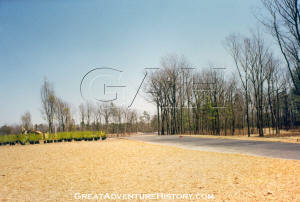 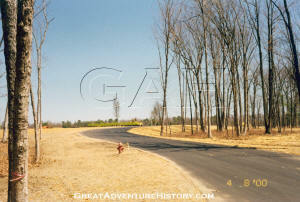 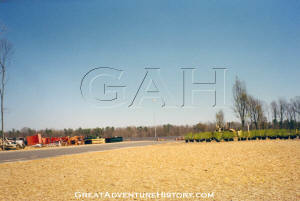 The parking area was constructed to be overly large, creating auxiliary parking spaces for the theme park on busy days. 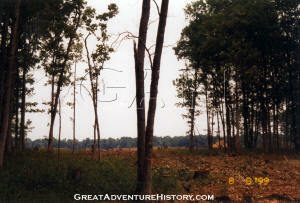 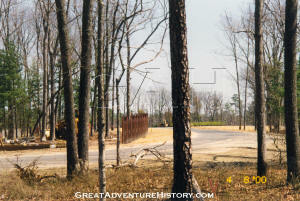 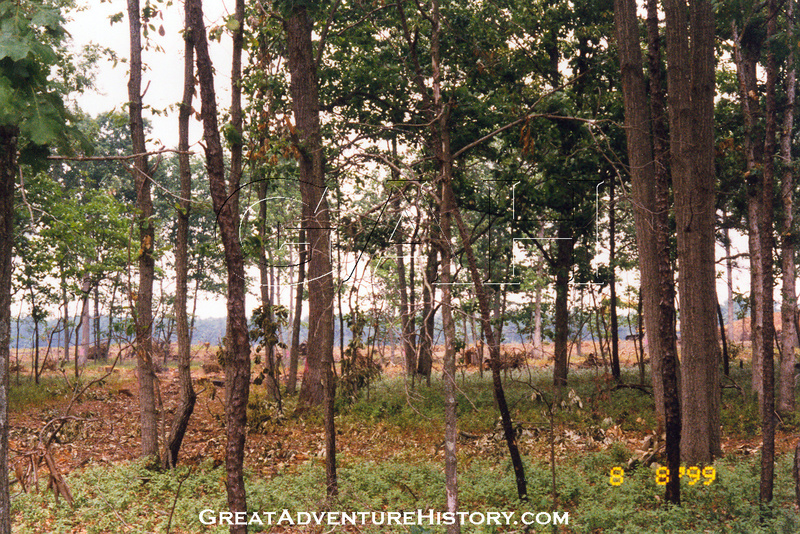 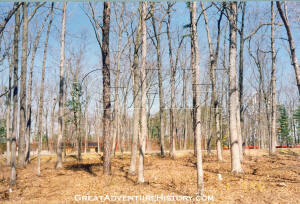 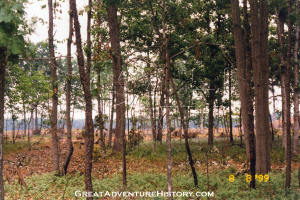 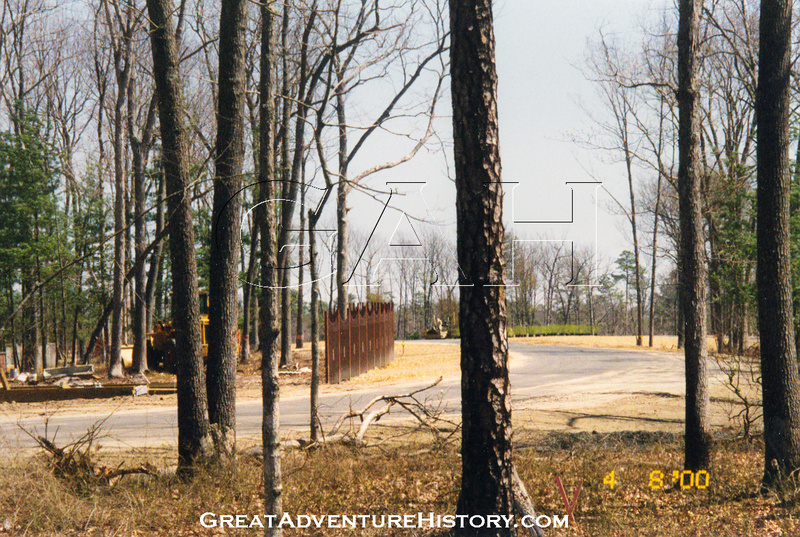 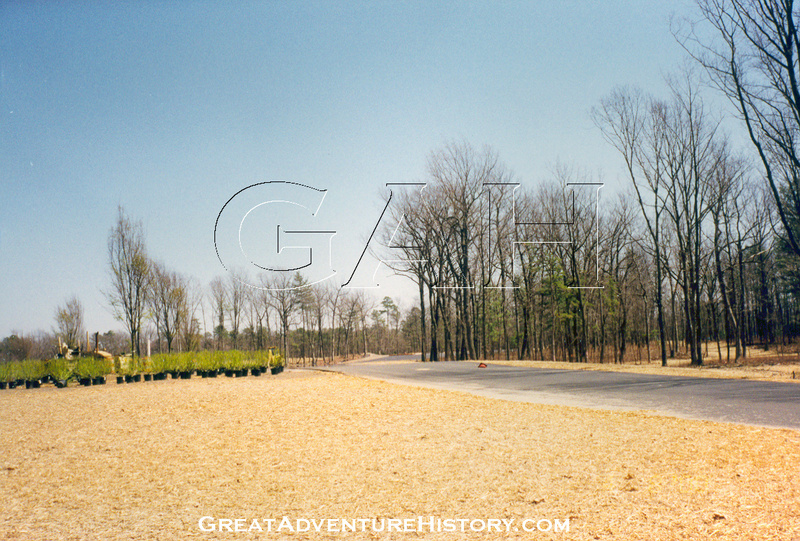 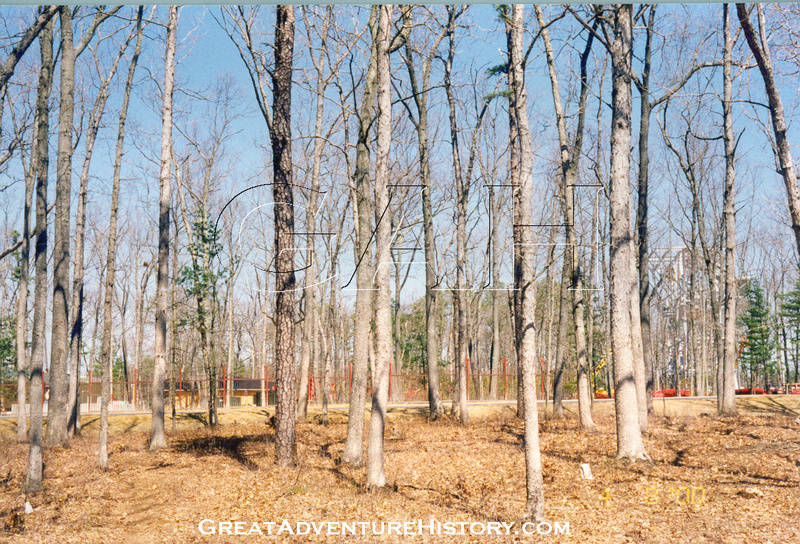 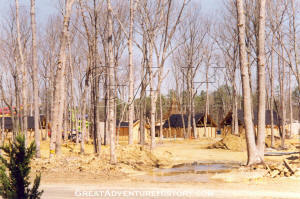 Within the area that would become the park itself, great care was taken to preserve as many of the trees as possible, harkening back to the construction of the original theme park area in 1974, when every effort was made to preserve as many trees as possible to help maintain a lush and natural environment. 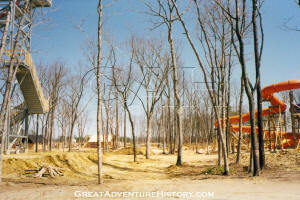 The crews had a lot of work ahead of them, creating an entirely new park from the ground up. 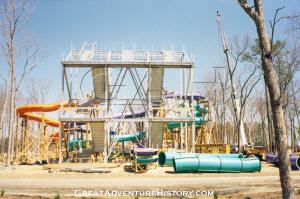 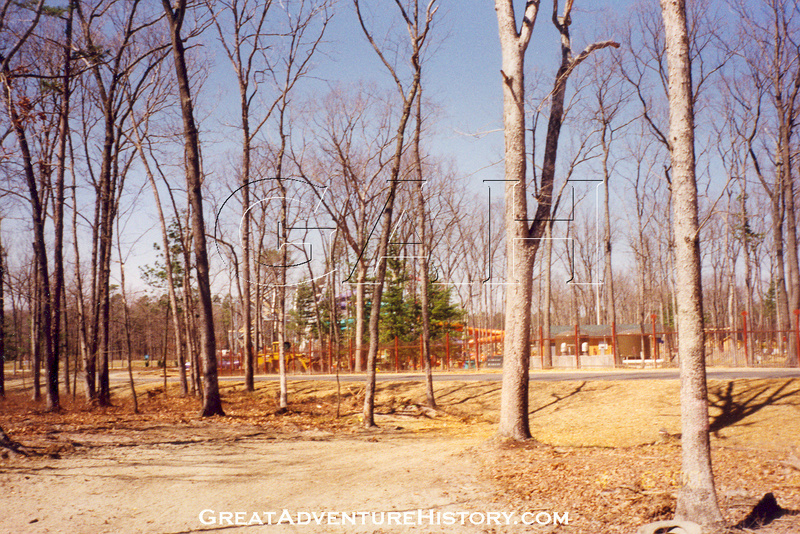 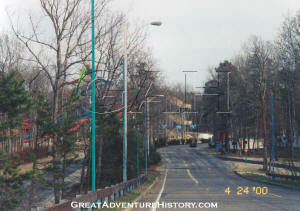 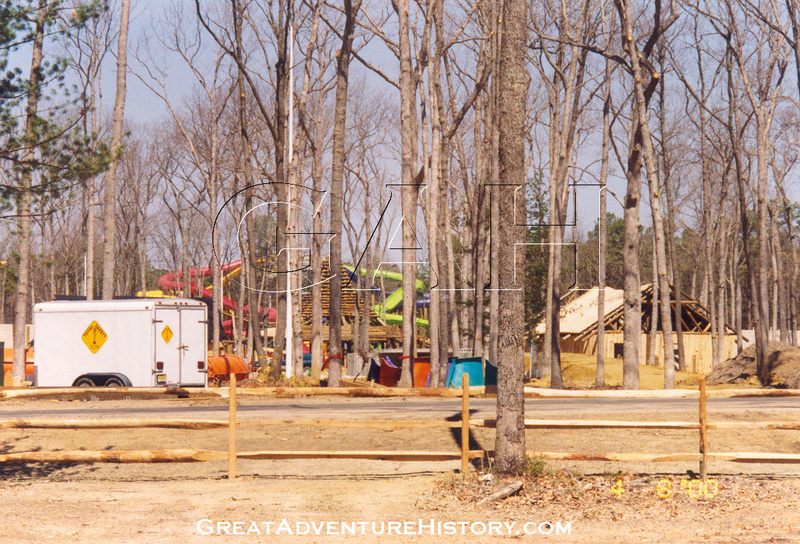 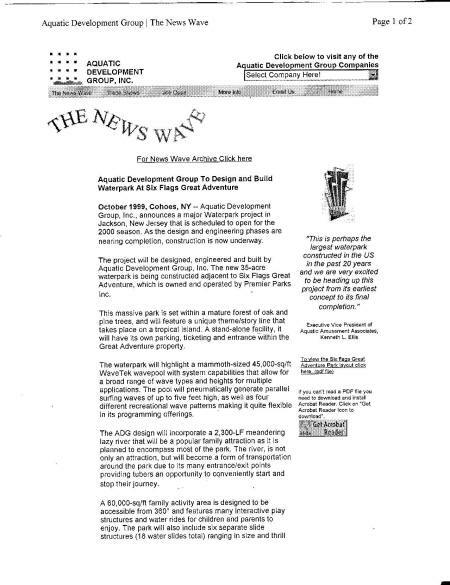 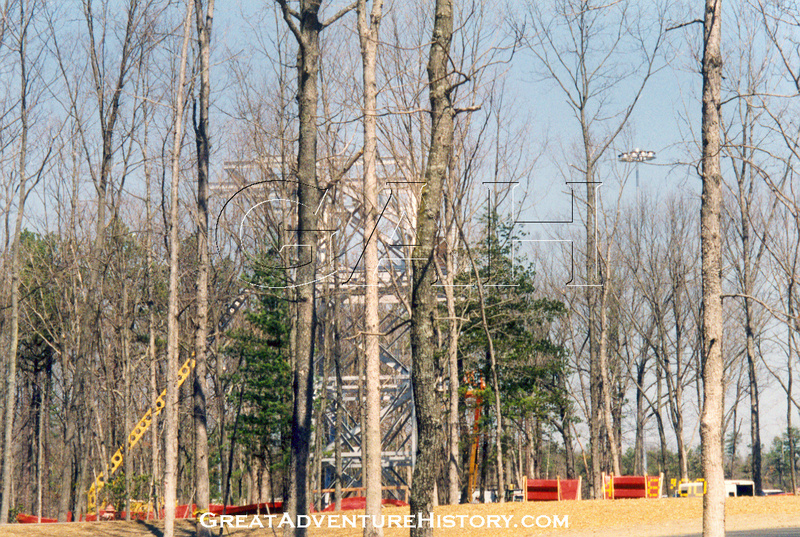 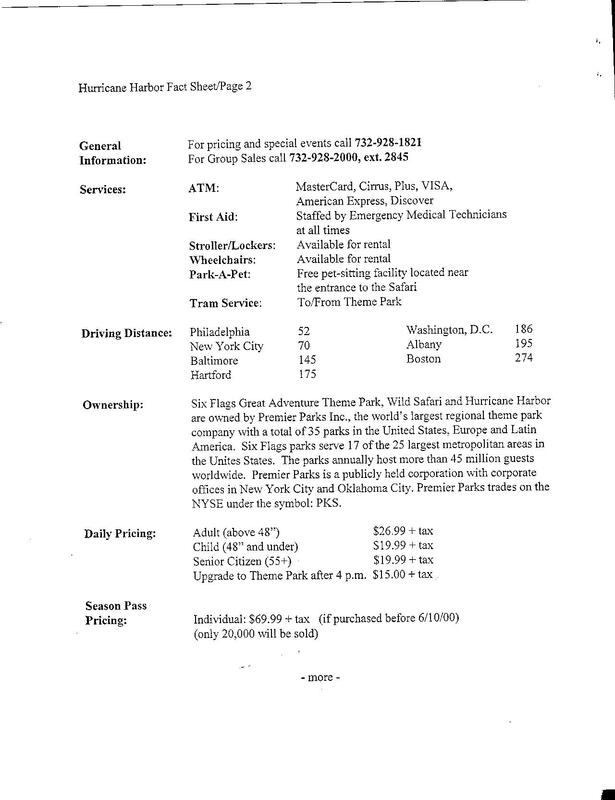 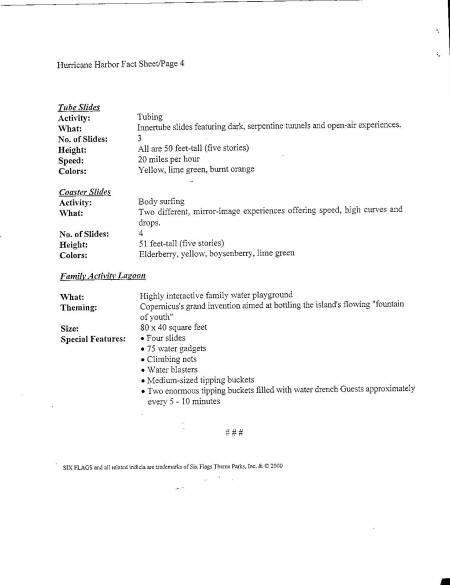 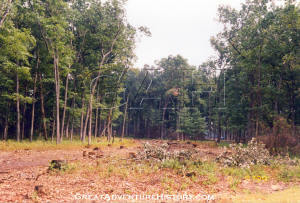 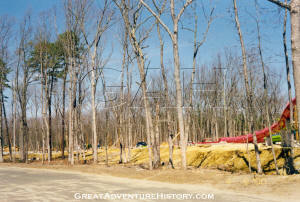 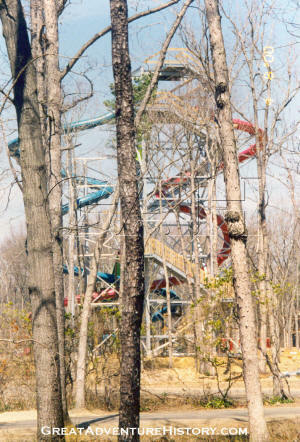 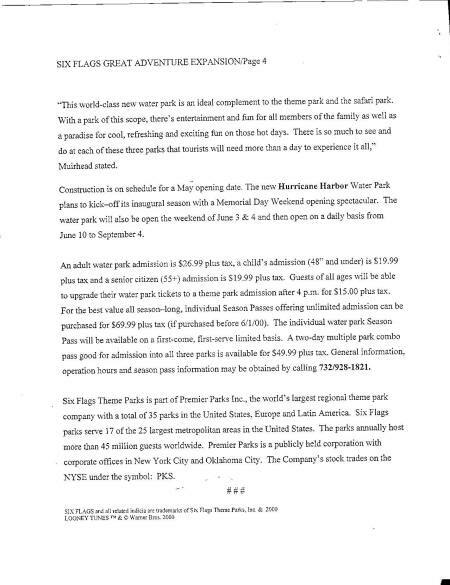 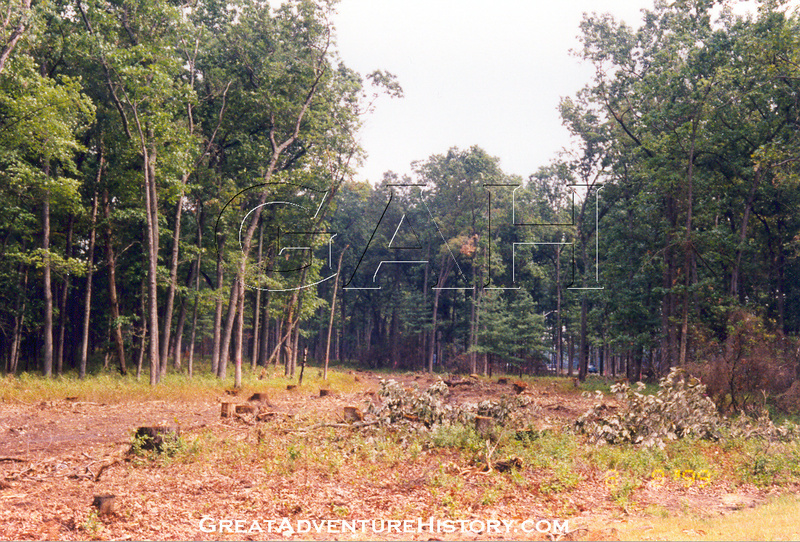 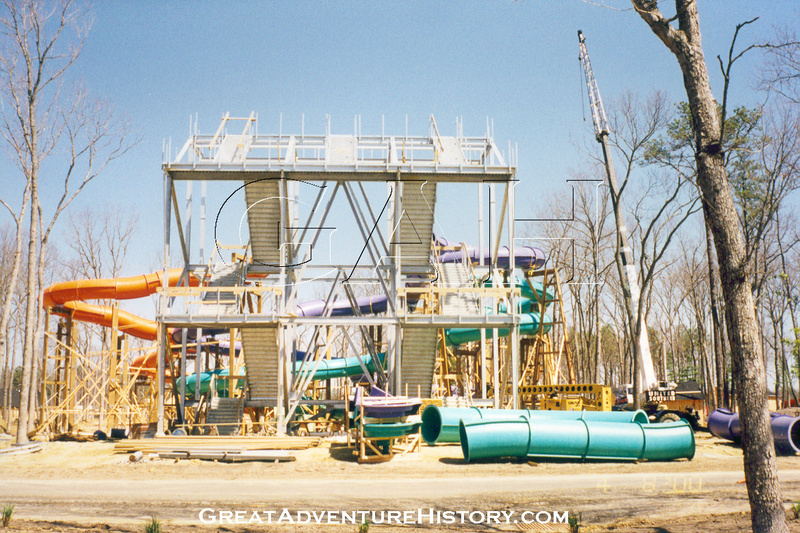 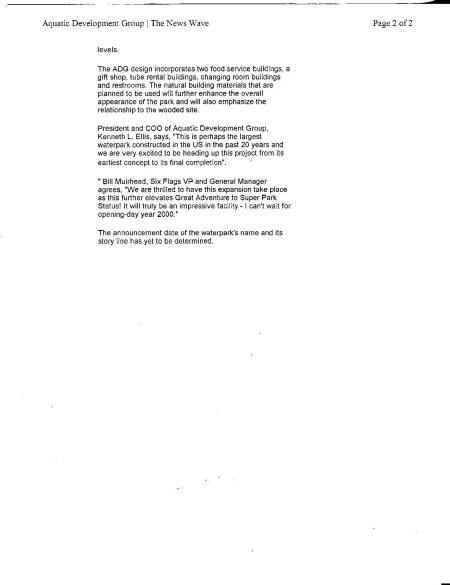 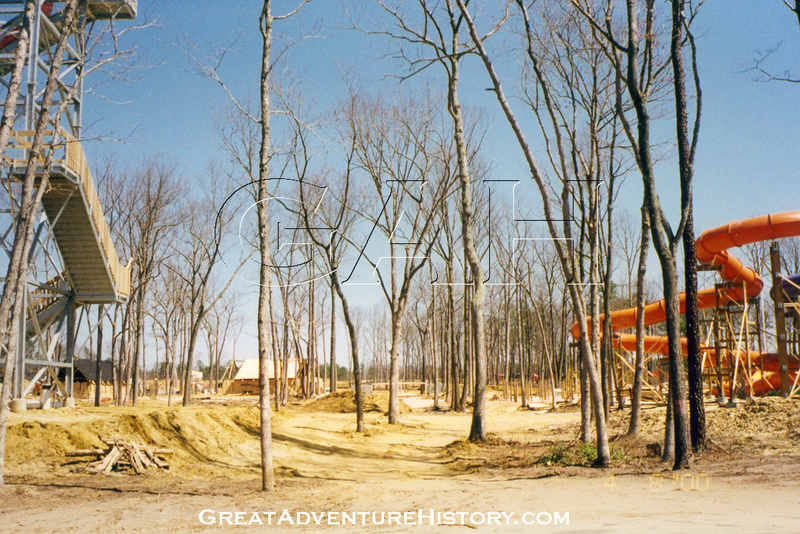 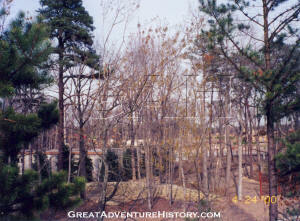 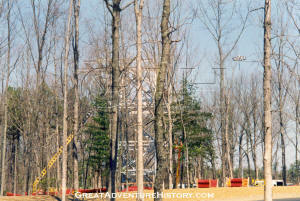 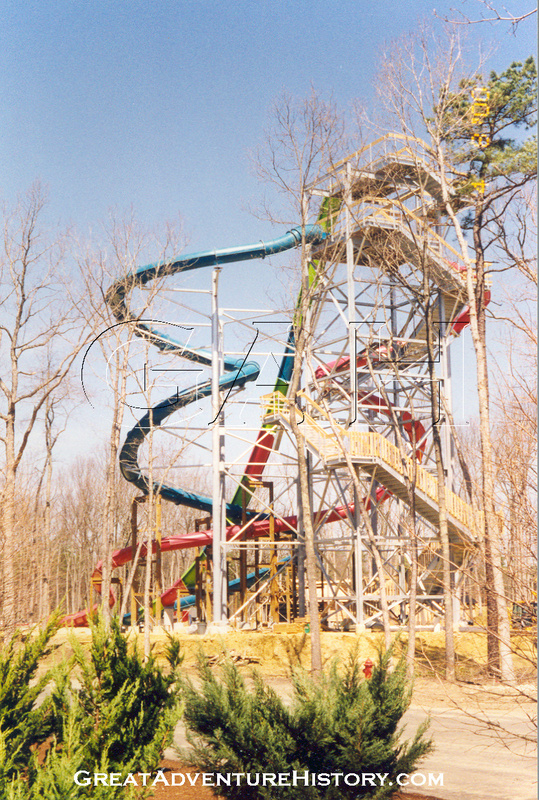 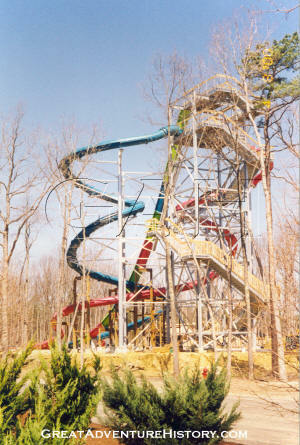 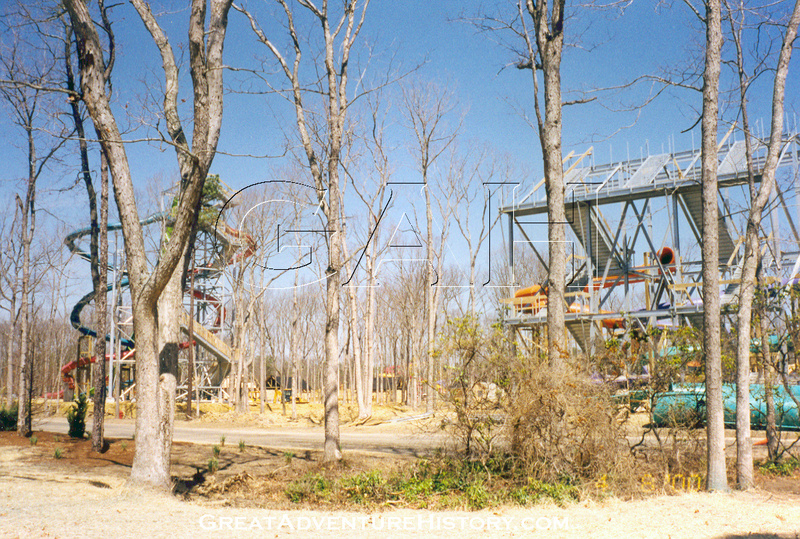 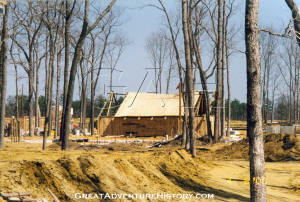 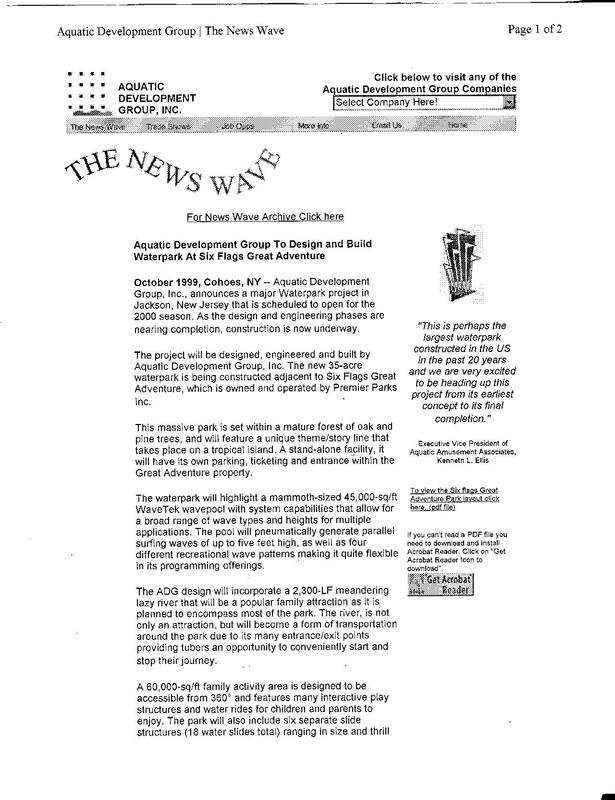 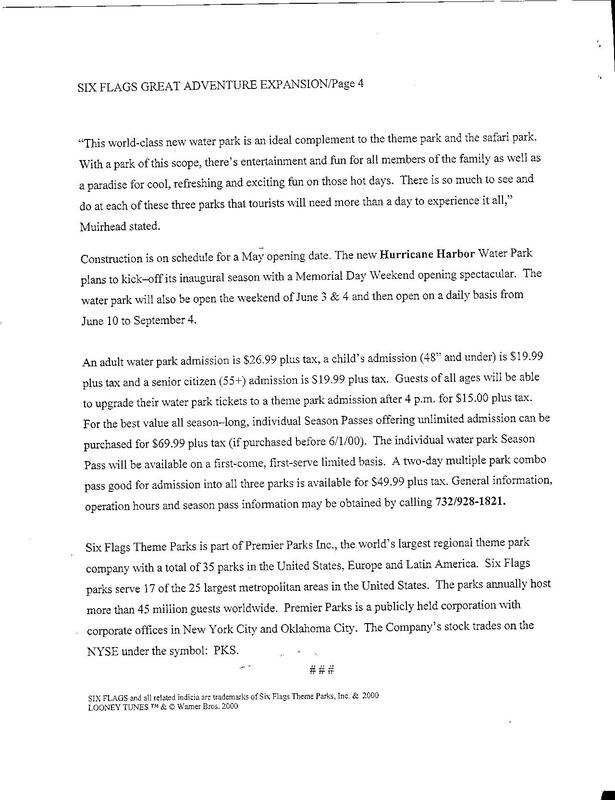 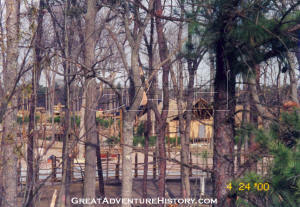 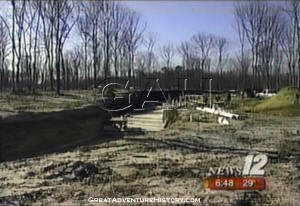 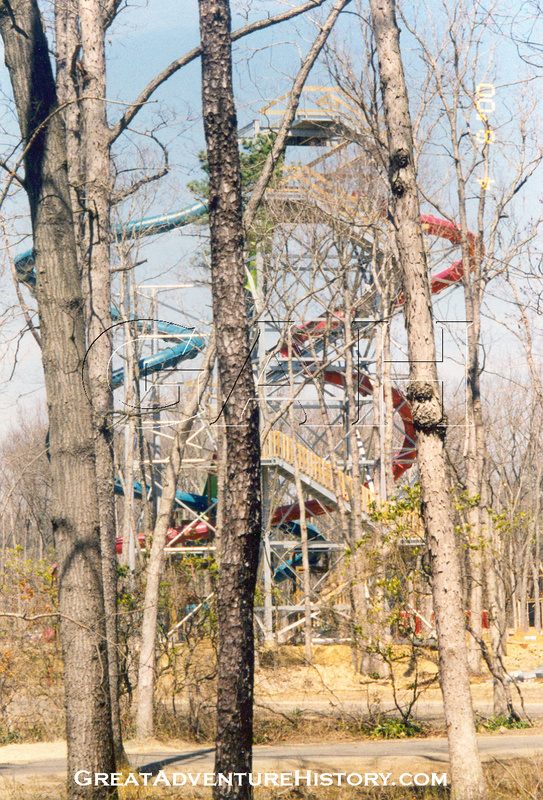 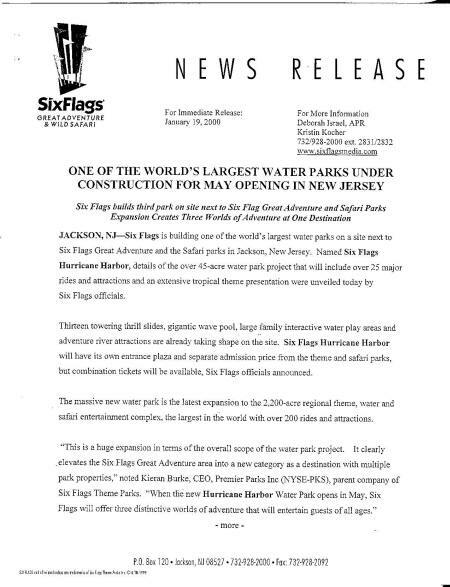 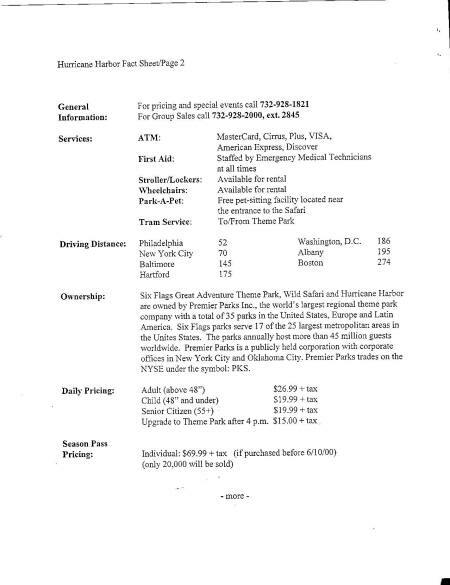 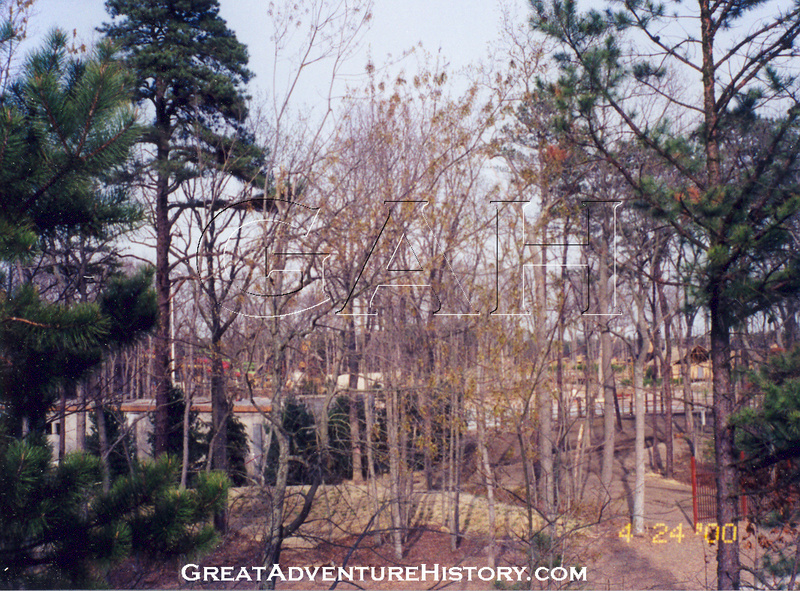 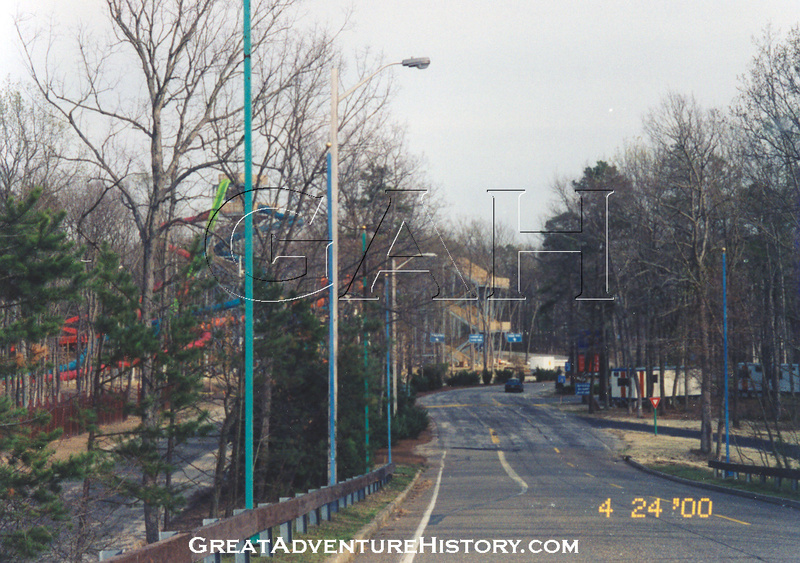 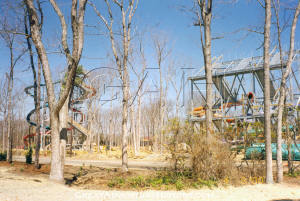 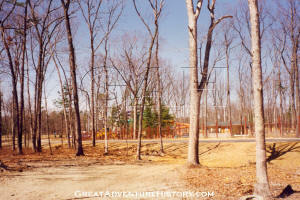 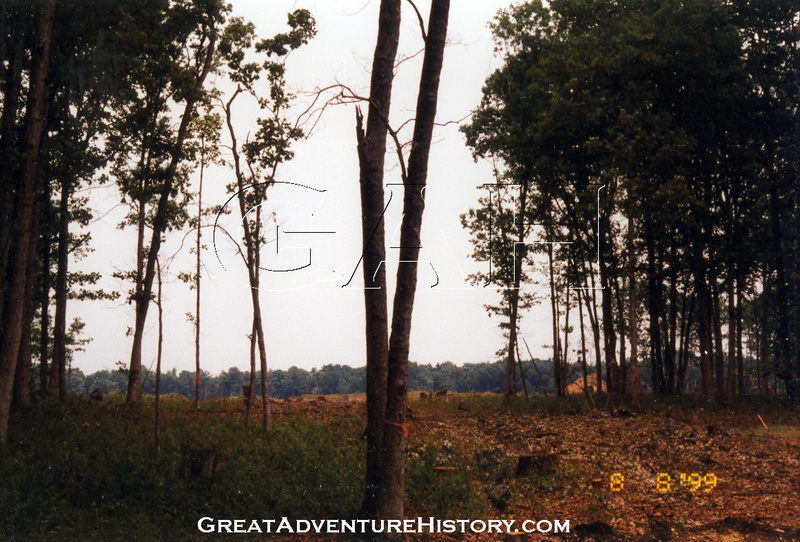 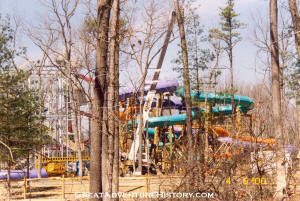 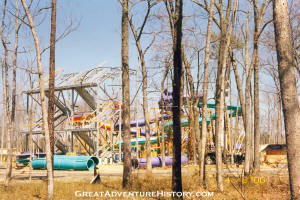 At the time the park was officially announced during the 1999-2000 off season, New 12 New Jersey reported on the park and its construction progress. 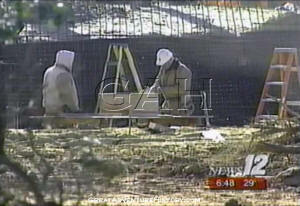 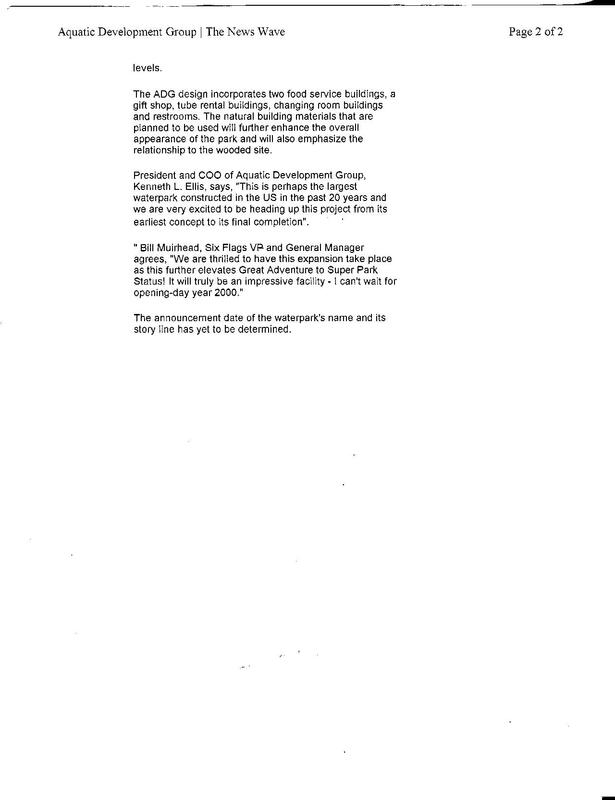 The screen captures from the news report show the workers had completed the footings for the slide complexes and were hard at work preparing for the concrete linings of the pools and Lazy River. 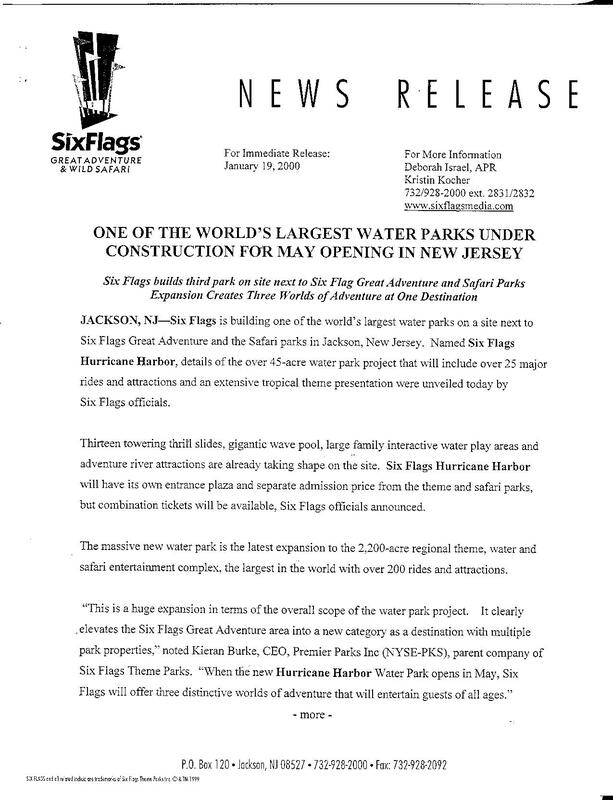 Despite the early start on the project, the winter weather was uncooperative with the construction schedule, causing delays in the project which would result in delays in attractions opening with the park's Memorial Day Weekend grand opening. 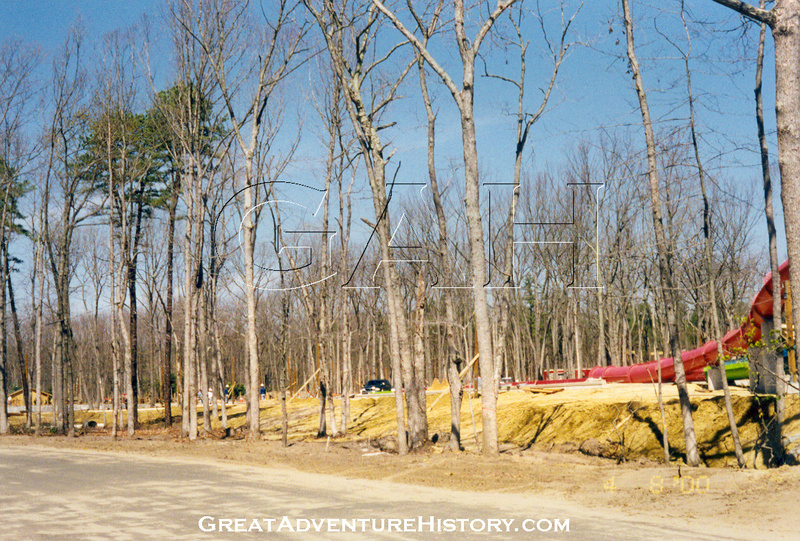 With the opening of the Theme Park and Wild Safari for the season in early April and less than two months until the scheduled grand opening, the waterslide towers were rising up through the trees, and the structures of the village were starting to take shape. 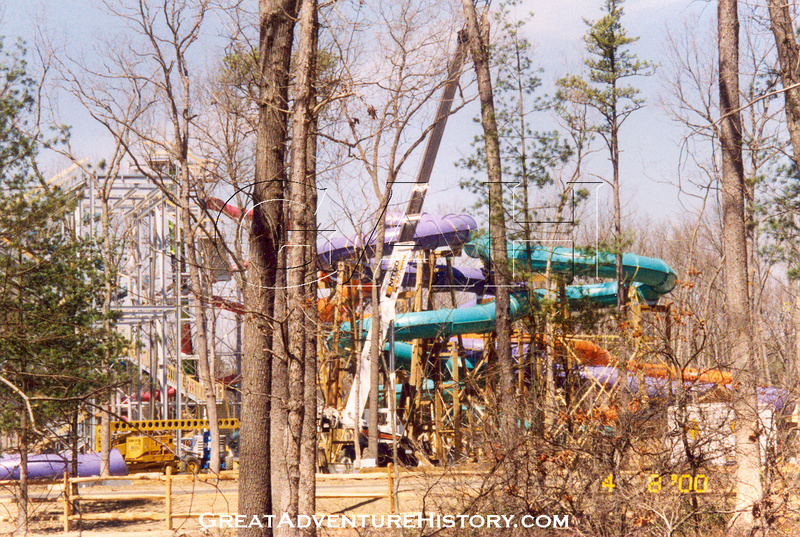 The colorful tubes and chutes were being assembled and placed on the towers, as the paving inside and outside the park was being completed with the warmer weather. 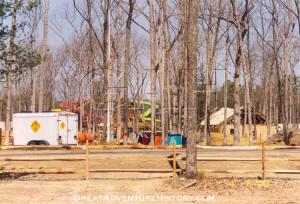 Crews were working on the carpentry, plumbing, and electric systems all around the park. 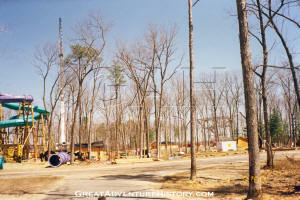 Stacks of light fixtures, lumber, fiberglass tubes, and spools of wire were all around the site. 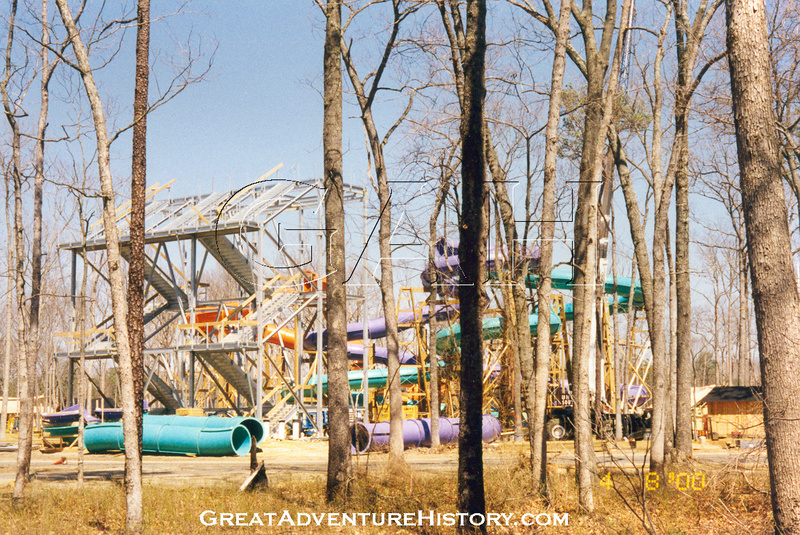 With each passing week, the slide complexes neared completion offering the guests entering the park property a sneak preview of the new park taking shape. 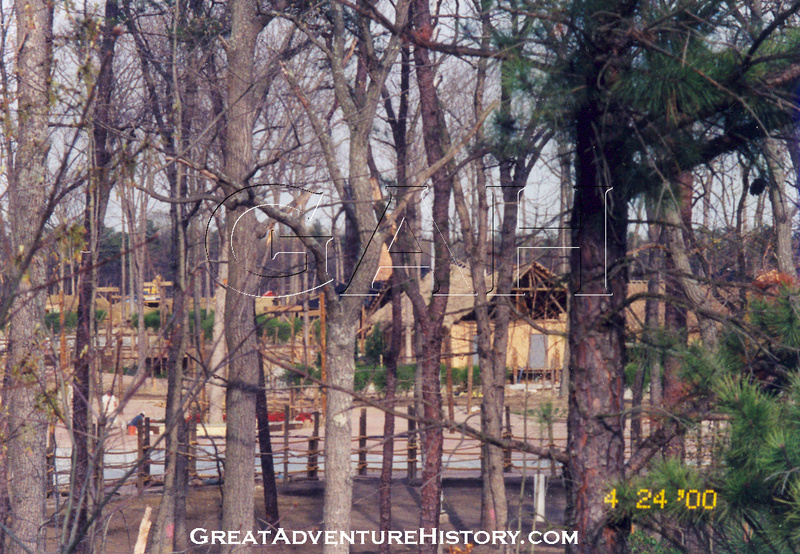 The weather continued to slow construction progress, with a cold wet spring taking its toll on the workers who were trying to get things completed. 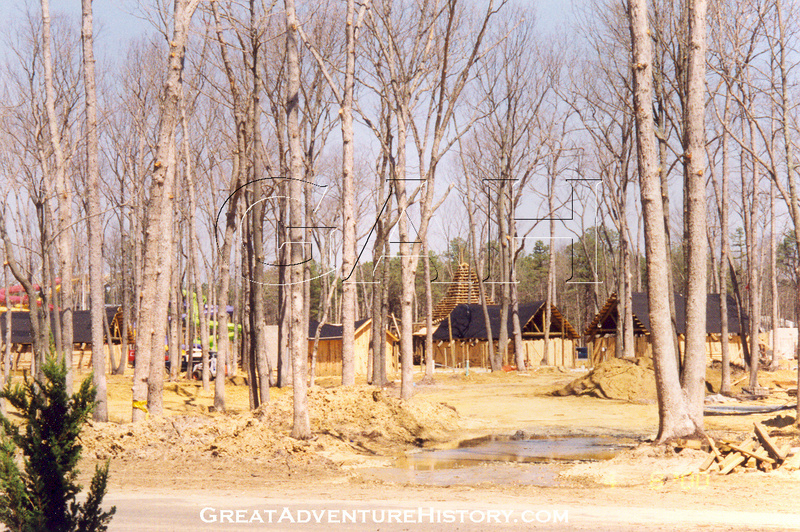 As the end of April approached, the structures got closer to being finished, and the buildings were at the stage where the theme elements like the thatched roofs were ready to start taking shape. 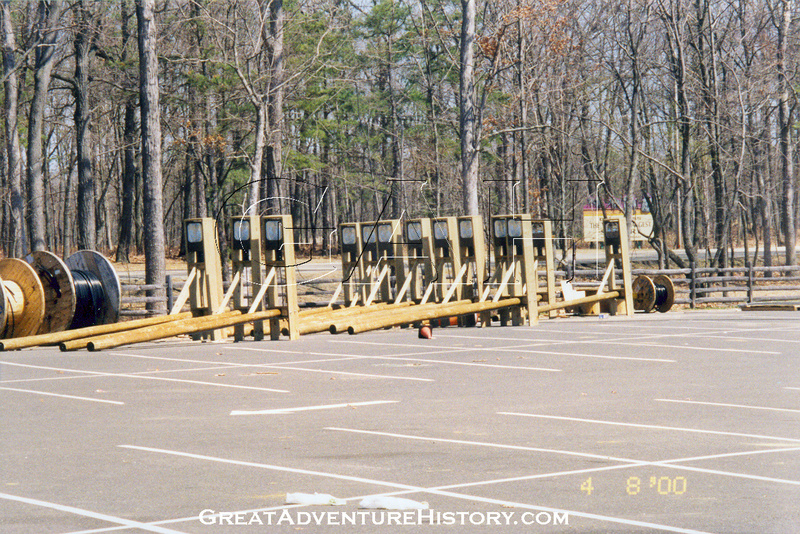 The bridges and walkways were being installed along with fences and the elaborate theme pieces scattered around the park.